If you are in dire need of cash, you can consider applying for SSS salary loan. This is one of the privileges that every SSS member can obtain. The interest rate and service fee are lower as compared to banks and other financial institutions. The amount that you can loan depends on the number of monthly contributions paid and the salary credits. But, not all salary loan applications get approval. In fact, there are many applications that were rejected. If you’re planning to apply for SSS Salary Loan, you should know the common reasons for rejected applications. It is required that an applicant must have 36 months or 3 years posted monthly contributions. There should be six months successive contributions within 12 months prior of filing the application. You should ask your employer or HR about your SSS contribution to know if all are posted. Another reason for rejection of salary loan application is if the SSS number is only temporary. If you had registered online the number given to you is only temporary. In this case, you are not qualified to avail any benefits from SSS. Thus, you need to convert your temporary number to permanent by completing the second stage of the registration. You need to visit any SSS branch to apply for permanent SSS number. You need to bring supporting documents like birth certificate, baptismal certificate, or updated passport. If you have an outstanding loan, make sure that you have paid 50% of it prior to applying for another loan or renew it. As much as possible, you should wait for a year after your current loan amortization is completed. Again, you should ask your HR what to do if there’s inadequate amount to pay so that you can renew your loan. This is very common, particularly for employed SSS members. There are instances in which employers were not updated in remitting the loan payments of their employees. To avoid rejection issues when renewing or applying for a new loan, you need to verify from your employer. Otherwise, if they failed to remit your payments after deducting from your salary, you have the right to file a complaint. 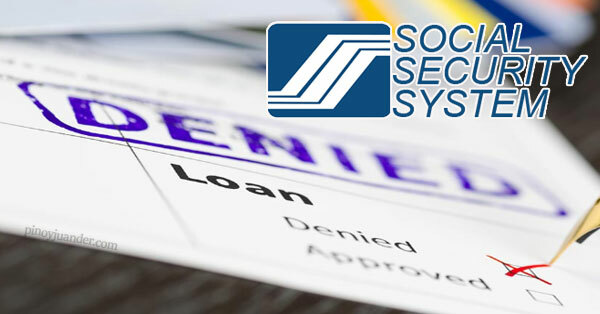 There are SSS members who come across problems when applying for a salary loan due to multiple registrations. If this is your case, you need to fix first your records. Choose the one that you’re currently using and cancel the other numbers. You can consolidate all the contributions made into the current number. Considering those reasons discussed above will spare you from possible rejection if ever you apply for SSS salary loan.